The Flying Santa is a book the entire family will enjoy. 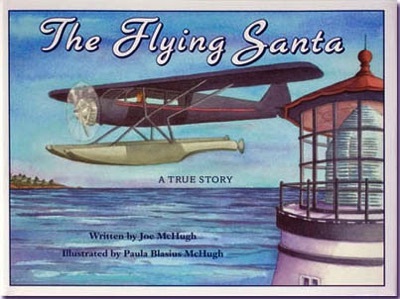 Written by storyteller and public radio producer Joe McHugh and illustrated by Paula McHugh, the book follows the life of Bill Wincapaw from his boyhood love of flying, his close friendships with airplane designer Glenn Curtiss and noted aviator Charles Lindbergh, to that fateful night fighting for his life in the teeth of a winter storm and his efforts afterwards to repay the kindness of the keepers. It is a timeless tale about having the courage to follow your dreams, the importance of generosity, and the honoring of tradition. 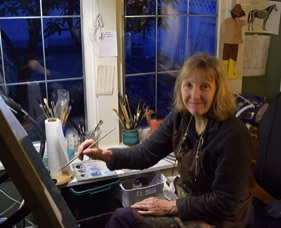 Paula Blasius McHugh is fascinated with the idea of blending different art forms together and having enough time to truly appreciate them, in other words, slow art. The blending of storytelling, music, and art in Paula and Joe McHugh's Time Travelers performance enhance her paintings so the viewer “audience” enjoys a much richer experience then they would have in a gallery. Born and raised in the midwest, she studied fine art at Edinboro State College and at the Museum School of Fine Art in Boston. From 1979-1988 she worked as a glass artist designing and creating stained and etched art glass pieces for private residences, businesses' and museums in Pittsburgh, Pa. Teaming up with her husband she has illustrated and designed several books along with producing two award-winning radio-drama based curricula for use in elementary and middle schools. Together they founded their own publishing company, Calling Crane Publishing for which Paula has served as graphic artist and web designer. 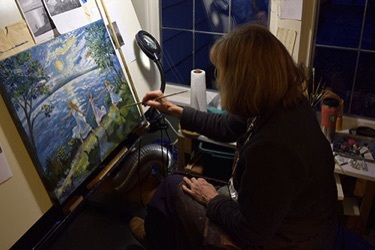 Paula's most recent work has been a series of oil, watercolor and egg tempera paintings based on the evocative titles and history behind traditional American fiddle tunes.